Hanoi (VNA) – A forum was held in Hanoi on May 23 with a view to providing Australia with an insight into the real situation of Vietnam’s energy industry and helping domestic firms to explore the possibility of cooperation with Australian partners. Energy security is a priority of both Vietnamese and Australian Governments. The two countries have been enhancing partnership in industry, education-training and research on energy. 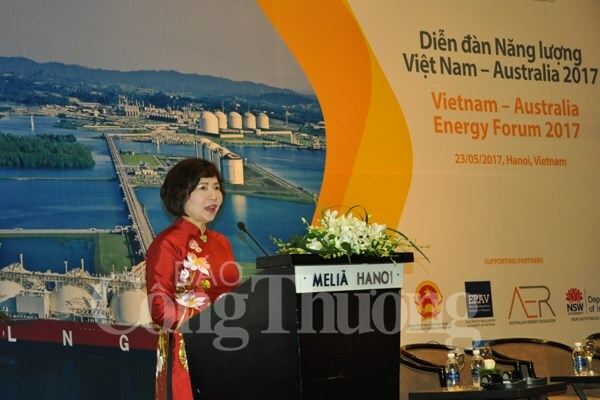 Deputy Minister of Industry and Trade Ho Thi Kim Thoa said Australia’s strengths in the fields of coal and gas with modern technologies can help Vietnam ensure energy security and protect the environment. Hence, the two nations hold great potential for cooperation in the sphere, she noted. Janelle Casey, Commercial Counsellor of the Australian Trade and Investment Commission (Austrade), expressed her hope that through the event, the two sides will understand better about cooperation opportunities and bolster linkages in energy, trade and investment. Report released by the Ministry of Industry and Trade showed that commercial electricity growth has been on the rise over the past 15 years. Demand for electricity also strongly increased, growing by 13 percent in 2006-2010 and 11 percent in the last five years. It is estimated that the country’s electricity demand will grow about 10 percent in the next 10 years. To ensure its energy security, Vietnam has been shifted from an energy exporter to an importer. The country is projected to import 17 million tonnes of coal, accounting for 31 percent of coal demand to generate electricity in 2020.